Last year was my first year taking part in a mock award when my lunch book club did the Mock Newbery. 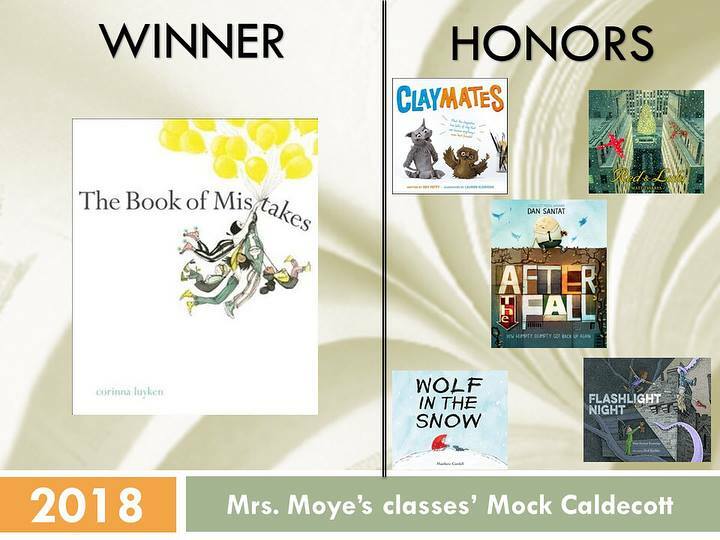 I loved the process and the conversations, but I really wanted to move to a less stressful book club and make the process more focused and to get more students involved, so I decided to do a mock award with my class; however, I knew that doing the Newbery well is a very long process, so I thought the Caldecott would be interesting to try with middle schoolers. And I was right! 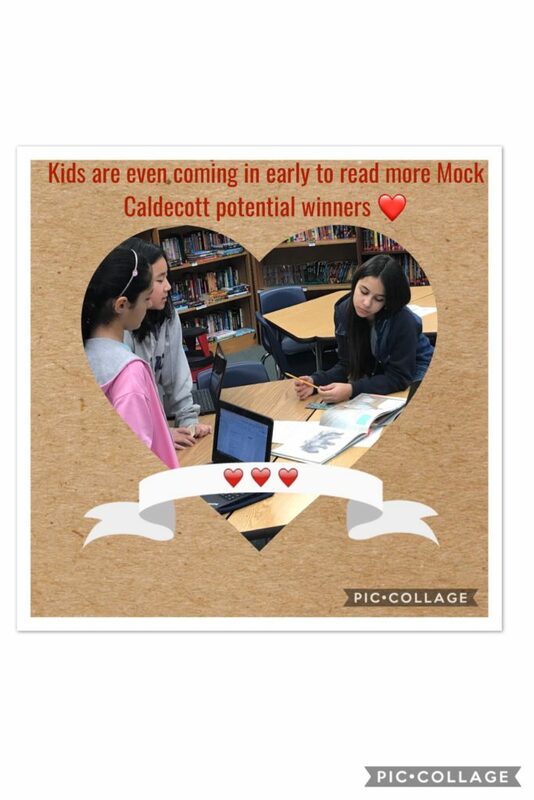 When I decided to do a Mock Caldecott unit, I didn’t really know what I was doing, so I turned to my friends on Twitter who have done Mock Caldecott lessons before. I also turned to good-ole Google. With all of this help and a bit of hard work, I felt pretty good to start. To justify a Caldecott Unit, I needed to tie it to middle school standards, and I chose to focus on the standards of citing textual evidence to support analysis and presenting claims and findings with relevant evidence. There were also five secondary standards that fit the unit. LAFS.8.RL.1.1 2 Cite the textual evidence that most strongly supports an analysis of what the text says explicitly as well as inferences drawn from the text. LAFS.8.SL.2.4 3 Present claims and findings, emphasizing salient points in a focused, coherent manner with relevant evidence, sound valid reasoning, and well-chosen details; use appropriate eye contact, adequate volume, and clear pronunciation. LAFS.8.SL.1.1d Acknowledge new information expressed by others, and, when warranted, qualify or justify their own views in light of the evidence presented. 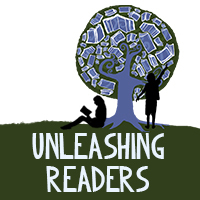 LAFS.8.RL.1.2 3 Determine a theme or central idea of a text and analyze its development over the course of the text, including its relationship to the characters, setting, and plot; provide an objective summary of the text. 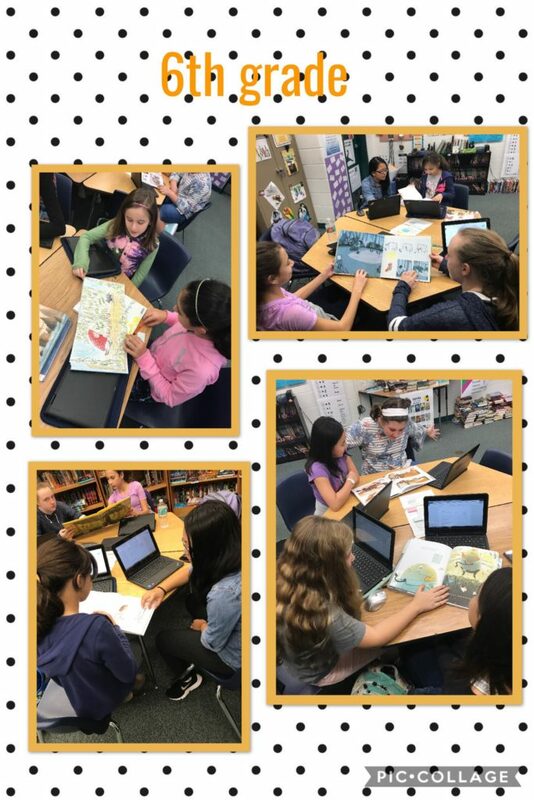 LAFS.8.RL.1.3 3 Analyze how particular lines of dialogue or incidents in a story or drama propel the action, reveal aspects of a character, or provoke a decision. LAFS.8.RL.2.5 3 Compare and contrast the structure of two or more texts and analyze how the differing structure of each text contributes to its meaning and style. LAFS.8.RL.2.6 3 Analyze how differences in the points of view of the characters and the audience or reader (e.g., created through the use of dramatic irony) create such effects as suspense or humor. After determining the standards, I created a scale to help plan my timeline. 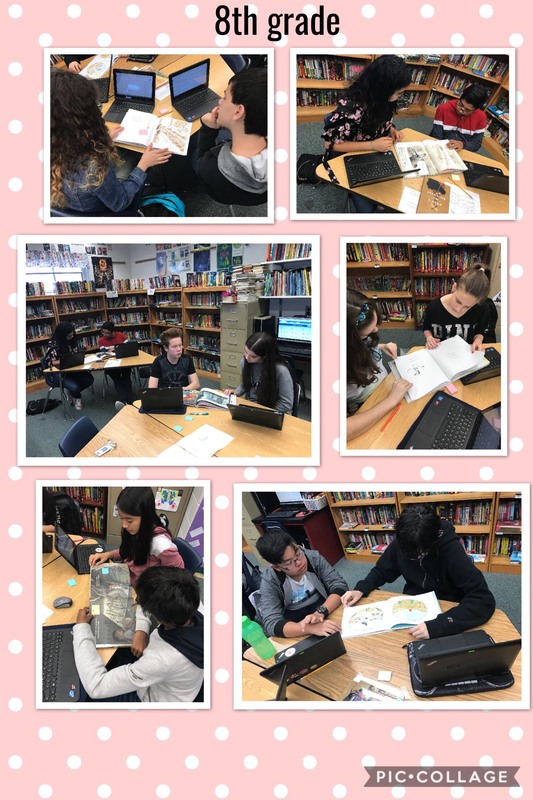 I knew I needed to start with the students understanding the Caldecott criteria and end with students presenting claims and evidence supporting their claim. 3 I can present claims and findings with sound reasoning, relevance, and cite evidence from the text that supports my analysis. Choose which potential winners they believe will be honored and present this claim using evidence from the text. 2 I can cite evidence from a text that supports my analysis (using a set of criteria). Analyze past winners for criteria. Analyze potential winners for criteria. 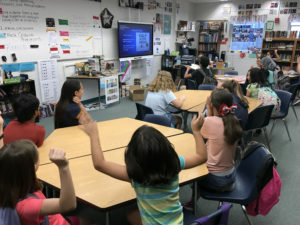 I’ll be honest, I really didn’t know where to go from here… Luckily, there is an amazing teacher from Illinois named Jessica Lifshitz who teaches 5th grade and wrote such a brilliant post about the Mock Caldecott unit in her classroom, and I finally felt like I could proceed with this unit and do it well–all because of this post! I’ve emailed Jessica to thank her, but I also want to publicly do it here–thank you, Jessica! Du Iz Tak? I think this book was honored over other picture books in the year it was published because the story is fun and in a made-up language which made us think about what they were talking about and try to translate it to English. She uses lots of space and colors. Some pages there are no words which make the pictures necessary to understand it. The medium she uses are gouache and ink. Journey This book was honored over the others because the illustrations had such good creativity and were very unique. There was no writing, so you had to rely on the pictures to tell the story. The bird found the girl after she set him free, and led him to a friend. The story has a very good meaning, and a good purpose. It had a variety of contrasting colors, and showed the most important stuff in bright colors. It had a very powerful visual experience. It showed the plot, setting, and characters in illustrations. Her world was bland in the beginning, but after she came into the new world, everything explodes with color. King Bidgood’s in the Bathtub I think that this book was honored because all of the illustrations in the book are very detailed and tell the story without words. If you were to remove the words from the book you would still know what was going because all the pictures are very detailed and have a lot of different colors on every page. Where the Wild Things Are I think this book was honored by how realistic the illustrations are and for how fun the story is. I love the leading lines the illustrator uses how there are no words over the illustrations giving the book plenty of white space. All the spreads have plenty of happy colors which for me makes the book very appropriate for kids. Swimmy The book was drawn with watercolors. The illustrator was very meticulous and detailed when he was painting the pictures. It actually felt like some objects had a texture that you could feel. It was very entertaining. Younger children would be fascinated with the drawings and would love the story. This was a great book in all aspects. Interrupting Chicken I think this book was honored because it included other famous stories but with a plot twist. They included little red riding hood and she was on her way to go to her grandma when she met a stranger and the chicken said don’t talk to strangers. Then the story ended so fast. The style of the chicken’s drawing of his own story was like a child’s actual drawing. It was very kiddy and I liked that the story was kind of based off of what the dad was trying to do to the chicken. He kept telling him stories but he never fell asleep. Now the chicken told him a story about his dad not falling asleep but in real life the dad fell asleep before the story ended. The illustrations look like they are painted and the colors are very warm to make the room seem cozy. First read: Just read the book and enjoy! Second read: Focus on the illustrations. How do they meet Caldecott criteria? What does the author excel at? Use Post-Its to annotate your thoughts. Third read: Focus on the narrative elements of the story. Use Post-Its to annotate your thoughts on how the illustrations enhanced the narrative. Students started in pairs again then we scaffolded off to working independently. I also had them leave the Post-Its in the books, so the students were seeing thoughts across classes. Students were asked to get to at least ten of the mock books. We did this for over a week to allow them time to read as many as they can and also time to evaluate properly. At the end of the unit and the Thursday and Friday before the ALA Youth Media Awards, it was time to start making predictions. First, I had them rank the books they read from favorite for the Caldecott to least favorite. Using these predictions, I gave books numerical scores and figured out average scores. 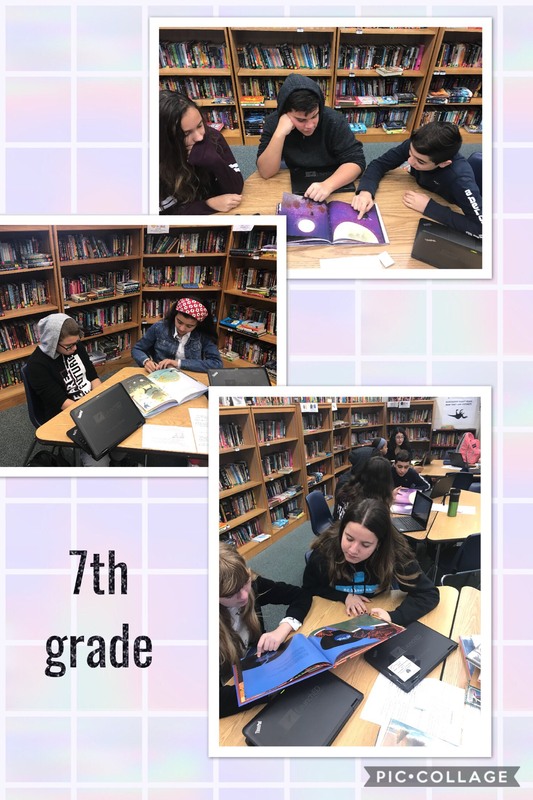 I also had students get together in groups of three to five to pick their collaborative four favorite books and awarded bonus points. With all of these scores, I was able determine the winners for each class as well as for all of my classes. What book do you feel best met the Caldecott criteria thus you feel should win? What criteria did it most meet? Share evidence supporting your claims. Use RATE: Restate, Answer, Textual Evidence, Explain/Elaborate! I think that The Book Of Mistakes should win because it does appeal to kids because it is very colorful, with much space so they can focus on what is important. The rest of the book is white except for the illustrations, which I think is easier for the kids to understand what is important. Also, the illustrator used a lot of artistic medium, with paint, pen, and other things, she made very good illustrations that connected with the story. They really made a visual experience, because if you just had the story, you would not know what was going on at all, and so you had to depend on the pictures to tell the story. 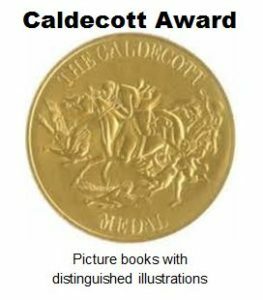 I think that this book should win the Mock Caldecott award because I think that it deserves it with beautiful illustrations that have a good meaning and theme, and I think that they really appeal to kids, and so therefore should win the Mock Caldecott Award. The illustrations were very nice, and they tell the characters, and other narrative elements. There was a lot of line, space, colors and other things that made the illustrations very unique among other illustrations by other illustrators. The colors did change depending on many things, and the color choices were very good. I think that The Book Of Mistakes should win the Mock Caldecott Award. I think After the Fall would win the Caldecott. The reasoning in this is because with the amount of detail put into the text more specifically the illustrations. The illustrations in the book show a big part of the story. It shows the sequence of events with the illustrations now that the egg falls then he lives a sad life without being able to climb due to his fear. You can see the emotion and detail with everything he does not like being grey or showing sadness. Then, in the end, he made an invention to be able to fly again a mini plane even with him having bandages and being injured after the fall. He tests it out and then it gets stuck on where he fell he decides to go up and with the pictures you could see how stressed out he was. Then at the end, you can see the light and feathers cracking showing that he is becoming a bird. But that’s not the first reference throughout the book it shows birds on every page giving reference to the end of it. Then you see him fly away into the sky after he hatches. 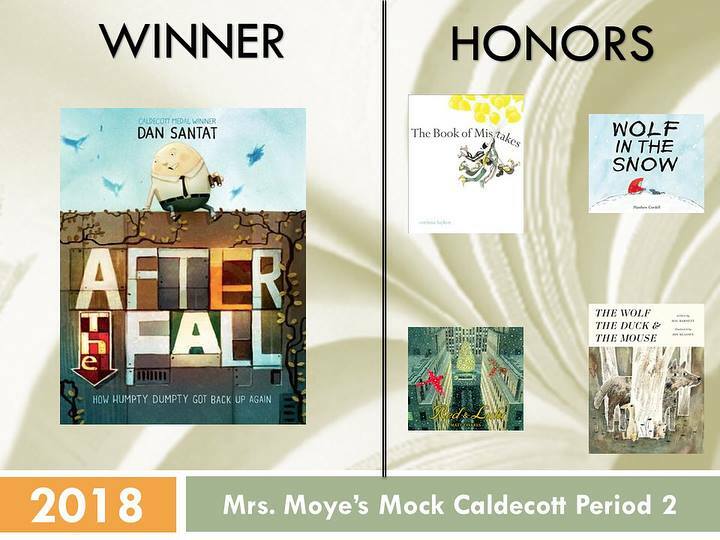 That is why After the Fall will win the Caldecott. The book Little Fox In The Forest is going to win because of its unique illustrations. These illustrations such as when the Little girl lives in a colorless world and brings her colorless fox to show and tell. When the little girl is swinging on the swing she finds the orange fox stealing her colorless stuffed fox . Now the little girl and her best friend is chasing the fox and follows the fox in the forest. Then all the sudden you start to see little experts of color, and then there was a very colorful magical forest. This book was such a good using of artistic medium and a very good visual experience this book definitely deserves to be on top. I think Wolf in the Snow should win the mock Caldecott because of the detail in the illustrations. It has a story in the illustrations which is about a wolf cub and a girl who help each other out. The detail in the wolves and every picture is great, for example, the wolves breath due to the cold environment they are in. This book really appeals to kids because of the illustrations they are showing like when the wolf stares at the girl holding the wolf cub, and it creates a questioning of what will happen next. This book does not need words at all because you can already see the story from the illustrations. This means there is a great visual experience in the book. The book that I think will win the Caldecott is Flashlight Night by Fred Koehler the illustrator of this book. I think this book will win because it tells the story with the imaginations of kids and uses lots of colors and is told amazingly. I think this book appeals to kids because it shows how you imaginations can take you anywhere. The art to make this book was very detail from one illustration to the next. The illustrations work amazing with the story because depending on what the illustration was the story would match up perfectly with it. 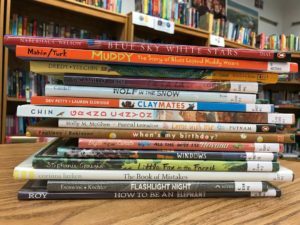 This are some of the reasons why I think that Flashlight Night should win the Mock Caldecott this year. On Monday, February 12th, my classes watch the ALA Youth Media Awards either live or recorded, and it was so much fun to watch their reactions when they saw books they read or their disappointment when their favorites didn’t win. We were so excited to see Grand Canyon and Wolf in the Snow honored with the Caldecott, and the students who put them high on their prediction felt so validated. There were three Caldecott honor books that we hadn’t had in our pile, so we have them coming from the public library, and I promised them that we’d have a conversation on why those titles may have won over the ones that we chose. I never got this level of analysis from my graduate students! 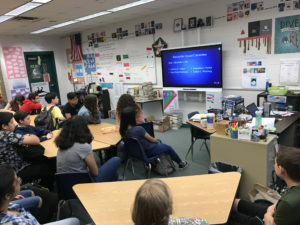 Wonderful lesson! I love comparing kids’ choices with adults’ choices – sometimes there’s a lot of overlap, but sometimes there’s some pretty fascinating differences!! 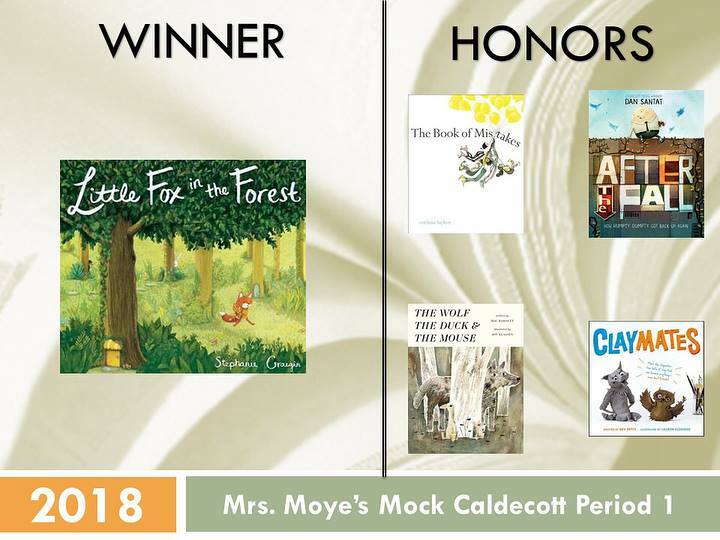 I do a Mock Caldecott unit in my Children’s Literature class each January and it seemed especially fun this year. (I also use Jess’s lesson plans–so great they work for college students too!) Little Fox in the Forest and Book of Mistakes were our top two. I had liked but not loved Book of Mistakes when I read it; my students’ enthusiasm really helped me appreciate the book in a new way.